I flew to Japan recently and discovered that a new entertainment system had been installed on my flight. Global gateways, those little landing pages that ask you to select your country or language (or both, aren’t just limited to Web pages these days. Every screen is bound to feature one. As more software is designed to be global from day one, we’ll see more of these screens. And as global gateways go, this one was pretty good. The 15 languages were in the native script and there were no extraneous visual elements. The screen had just one purpose and one purpose only, which you don’t always find with global gateways. Some companies thrown marketing elements that actually diminish the usability of these screens. 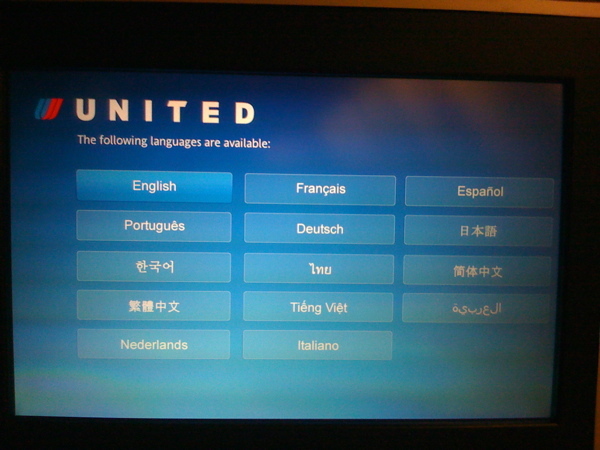 One problem with this gateway was the fact that my language preference wasn’t captured for the duration of the flight. As I learned how to the use the interface I had to re-select my language a few times. In this case, the movie was available in several languages and I could choose which one, while still maintaining my English-language interface. I’m not sure how many people would choose a different language than their interface language, but it was still interesting to see what translation investments the studios had made on various films. 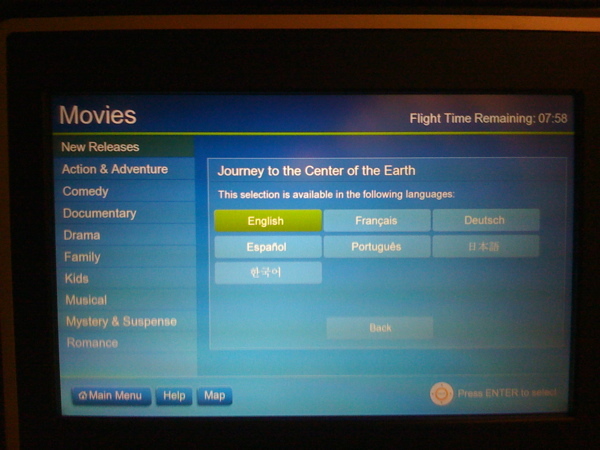 I would love to collect screen shots from other in-flight entertainment systems, to see how United’s system stacks up. If you’ve got any to share, please emal them to me. The only reasons I can see for allowing the user to chose languages for the film that are different to the interface language is that many users do not like dubbed films and also the choice of languages for the film selected is not as extensive as the choice for the interface. Italians, for example, would be at a distinct disadvantage and would probably chose Spanish over the English language version. But it is nice to see more and more companies taking localisation into account. Hi Ben — thanks for the catch on the Arabic text.